SPILLERS HAPPY HOOF and HAPPY HOOF Molasses Free are both extremely versatile and can be fed in lots of different ways or to all sorts of horses and ponies. Both feeds contain short soft chopped fibres and added vitamins and minerals and are approved by The Laminitis Trust. Here we have highlighted a few of the different ways that you can feed SPILLERS HAPPY HOOF and HAPPY HOOF Molasses Free to help you decide which is most suitable for your horse or pony. Most of us will know a horse or pony that maintains weight easily on forage alone and gets a very small bucket feed, usually looking longingly at us - ‘please sir, can I have some more?’! Adding a double handful of SPILLERS HAPPY HOOF or HAPPY HOOF Molasses Free to a feed balancer or broad spectrum vitamin and mineral supplement is a great way of bulking out the bucket and extending eating time with minimal calories added to the waistline. As both SPILLERS HAPPY HOOF AND HAPPY HOOF Molasses Free contain added vitamins and minerals they can be fed on their own as the whole bucket feed. However, in order to meet your horse or pony’s daily vitamin and mineral requirements (when fed alongside forage) you would need to feed it at a rate of 600g per 100kg of body weight per day so for example a 250kg pony would need 1.5kg of SPILLERS HAPPY HOOF or HAPPY HOOF Molasses Free per day and a 500kg horse would need 3kg per day. 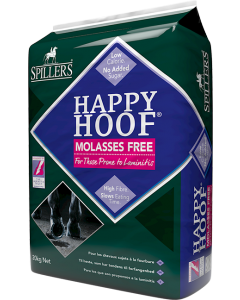 SPILLERS HAPPY HOOF and HAPPY HOOF Molasses Free can be fed alongside a cube, mix or mash containing added vitamins and minerals to contribute to a fully balanced diet. For example a 500kg horse could have 2kg of SPILLERS High Fibre Cubes and 1kg of SPILLERS Happy Hoof per day or another combination as long as it totaled 3kg. Both feeds are suitable to be used as full or partial hay/forage replacers. 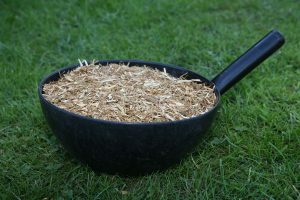 For those that struggle to manage longer fibres such as hay, haylage or grass a full or partial forage replacer can help to keep fibre intake up to maintain condition and digestive health. In addition for those very laminitis prone it can take the guess work out of finding a safe low NSC forage source as it is consistently less than 10% sugar and starch. We hope this helps, if you would like any further information or advice on what is most suitable for your horse or pony please contact our Care-Line on 01908 22 66 26.